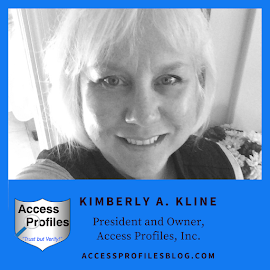 Access Profiles, Inc.: Do You Love Solving Puzzles? Then You Need to Think about a Career in Background Checks! Do You Love Solving Puzzles? Then You Need to Think about a Career in Background Checks! You are given a set of pieces, “facts”, and asked to fit them together to form a comprehensive picture of your subject. 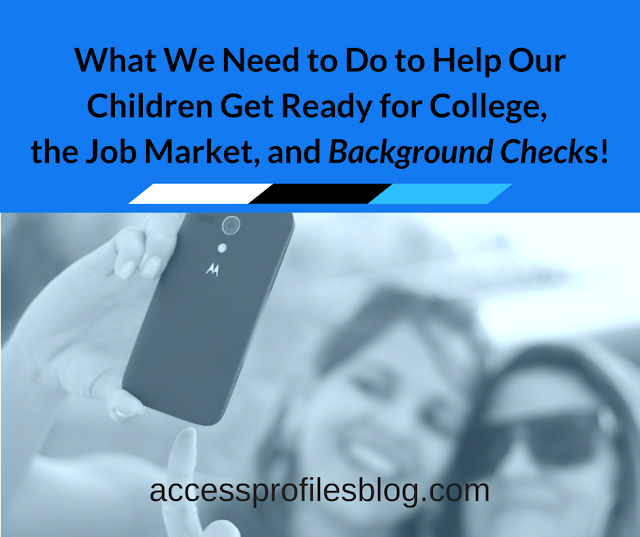 In the case of employment background checks, these pieces come in the form of an applicant’s resume or application. Your client, the employer, wants to know whether the information listed in that resume is true and accurate. Only then will they feel justified in making their new hire. Your job is to do the research necessary and provide them with the verified pieces of information they need. Those pieces are then used to form a bigger picture of the applicant. This is the puzzle you are asked to solve ~ and I find this work fascinating! By nature, I am a curious person. I love to learn about people ~ their skills, their interests, and what drives them. Doing background checks is a natural extension of this curiosity. “By nature, we are curious creatures. We wonder and surmise about many things. I know I am never happier than when I have a puzzle to solve. That is why I find myself again and again drawn to mysteries, both fictional and real-life. And I believe that is what has lead me along my career path ~ running my own Background Check investigation company! My love of a good mystery helped me develop my critical thinking. It has also taught me how to evaluate information, how to examine things below the surface, and how to take random pieces of information and form a picture that leads to a solution. These traits have been invaluable assets in my business. Many times the investigations I run are all about analyzing clues and getting a clear picture of my subject, whether it is a person or a business. Either way, I need to gather and determine the accuracy of information. I also need to put those pieces together. This is the profile I then supply my client. They trust me to weed through data and present them with a clear and concise solution”, excerpt from “How Following my Love of Mysteries Lead Me to My Perfect Business”! Finding a career that speaks to your interests, skills, and talents is key. When that happens, you will find the most fulfillment and success. I find the entire process of background checks and due diligence investigations immensely satisfying. I love taking the multiple pieces I discover about an applicant, or even a company, and turning that into a comprehensive and verified profile for my clients. So why not put your own Puzzle Solving Skills to Good Use? 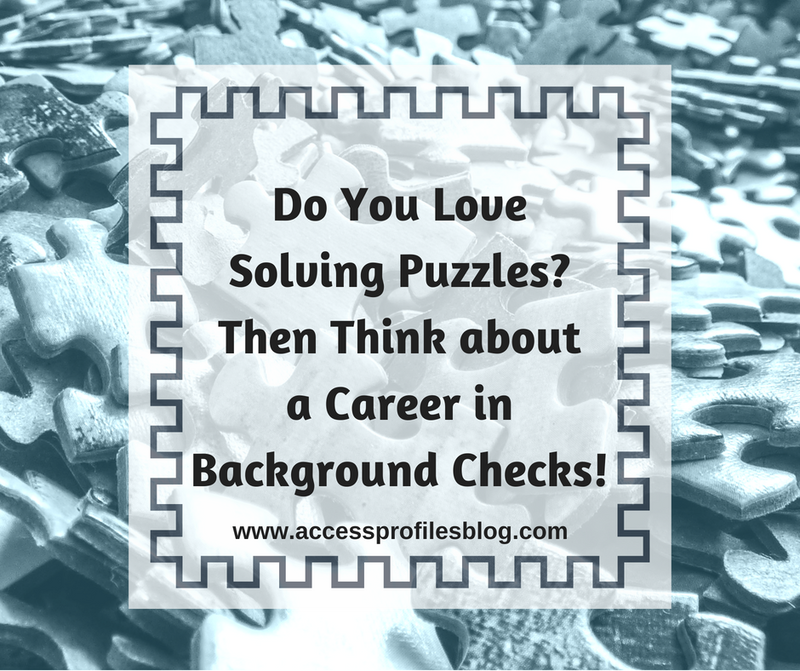 If you have the same curiosity, a love for solving puzzles, and a drive to find a solution to problems, then you should consider a career in background checks! You may find it the perfect way to turn something that you love into a real career! Do you think you might be ready to take the next step start a job doing background checks, or simply want more information? Or maybe you may even be thinking about starting a screening company of your own? We are ready to answer your questions and offer the business mentoring services that can help! Our Mentoring Services include sessions designed to cover both general topics, those relevant to all small businesses, and background check specific topics for those that want to start their own screening company. 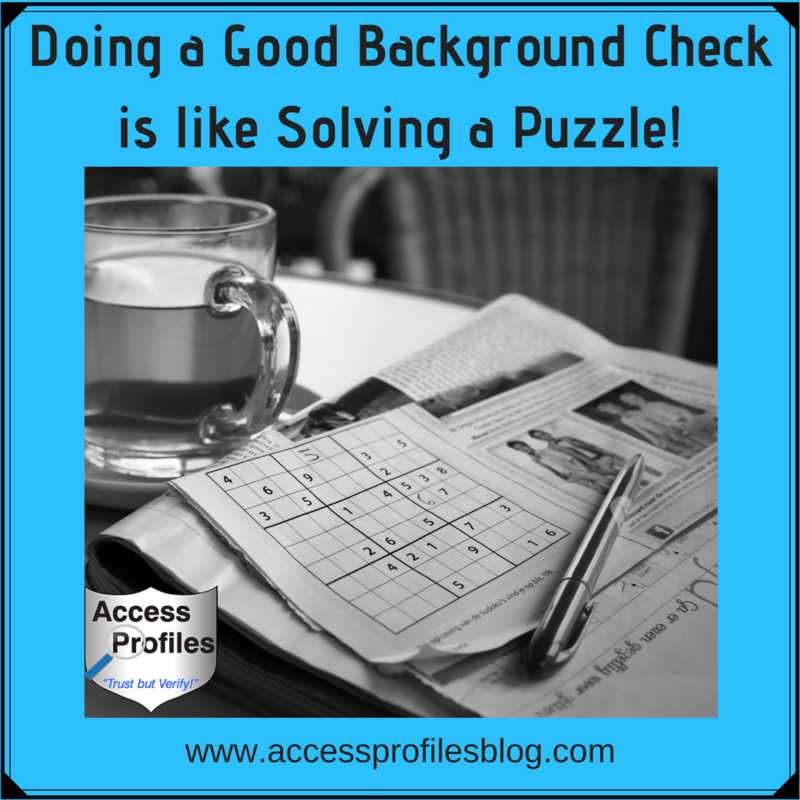 So, if are you driven by curiosity and puzzle solving, then doing background checks might be just the place where you find your true calling. And find out What Our Happy Clients have to Say too!